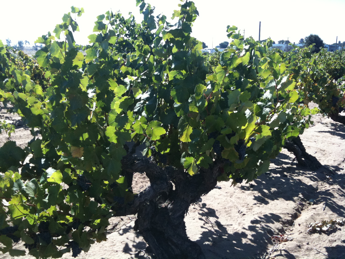 The Evangelho Vineyard is one of the great old vine Zinfandel vineyards left in California. Wines from vineyards like this are unique in the world and cannot be replicated anywhere; they are truly California's greatest gift to the vinous world (sorry Napa Cabernet!). Planted in 1890, on its own roots, on over 30 vertical feet of alluvial sand these vines somehow eek out an existence despite being farmed without irrigation and produce fantastic and soulful wines. The vineyard is at the westernmost viticultural edge of California's great Delta. Warm days, cool nights and wind define the climate that shaped this spit of sand into a once thriving agricultural area. Urban growth has impacted the area and now few of the old vineyards are left. Agriculture still dots the landscape, between housing developments and shopping centers: a reminder of the areas past. Harvest occurred on August 30, in what was one of the coolest years on record. A small heat wave was forecasted and not wanting to lose the edge on maturity we begged Frank Evangelho to assemble a small harvest crew. We were the first winery to pick and were delighted at freshness and complexity of the flavors, and the incredible ability of these grapes to hold their acidity (pH 3.1/ TA 9.0 g/L). Our 2.76 tons had a sugar of 25.8 oB at harvest. As was the custom at the time, our section of Evangelho is interplanted with smaller amounts of Carignane, Mataro (Mourvedre), Palomino, Muscat and probably some other varieties as of yet un-identified. We harvest them all a co-ferment them, in the true "field-blend" tradition. The grapes were de-stemmed to tank where they rested for a few days before the un-inoculated native yeast took hold. Fermentation was vigorous and clean. After three weeks of maceration the wine was pressed to older French Oak to preserve the pure expression of place. Malolactic fermentation was long and finished in April of '11. The wine was racked of gross lees and returned to barrel for bottling in March of' '12 (182 cases). Dark red to black in color with a defined red hue to the rim. The nose is at once explosive and meditative; the fruit, spice and earth notes are perfumed and exotic in nature. The acid and tannin contain the desire of the fruit to dominate the wine. This is a throwback of sorts, yet with modern aesthetics. The vineyard speaks loudly rather than the hand of the winemaker - something we firmly believe in.